In an election year and just ahead of annual Amarnath yatra, heavily-armed Pakistani militants struck in a big way today killing six people including a politician, two soldiers and a senior photojournalist of a local daily besides injuring six others, two of them critically. In an encounter that lasted for about 12 hours, security forces eventually killed two militants using heavy mortar after rescuing five people, who were held hostage by the militants in a house. The militant attack has raised questions on the BSF’s claim to have foiled an infiltration bid by Pakistani militants in Bainglad area close to the international border in Samba sector on Thursday night. The militants killed state general secretary of Indian National Democratic Party (INDP) Hoshiyar Singh, his wife Shashi Bala, 6 Garhwal Rifles soldier Atul Negi, 20 JAK Rifle Lance Havildar Aziz Mohammed, senior photojournalist of a local daily Ashok Sodhi and a woman Madhu Sharma besides injuring six others, including a Major of Territorial Army Mukul Chauhan and SP (Operations) Mubasir Latifi. The gun battle, which started at 6 am came to an end when 6 Garhwal Rifles of the Army, the BSF and the police launched the final assault at 5.30 PM killing the militants. Earlier, striking in a big way in the plains of Jammu after a gap of six years, militants in Army fatigues entered the house of Hoshiyar Singh this morning at around 6 am in Kaily Mandi and opened fire killing him and his wife. Eyewitness Virinder Singh said this morning he woke up to gunshots and being aware of the intrusion bid in Bainglad he along with other villagers immediately alerted the local police and soldiers in nearby Army units. “Acting upon the information, security forces rushed to the spot and cordoned off the entire area,” he added. After killing Hoshiyar Singh and his wife besides injuring their married daughter and her mother-in-law Darshana Devi, who had come from Amritsar, militants ran towards the house of Suresh Singh (Hoshiyar’s driver). 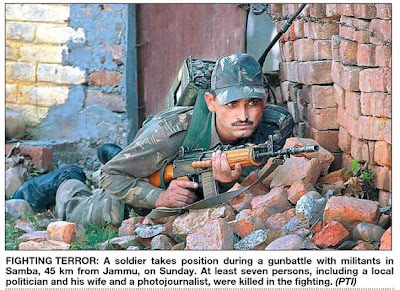 Another eyewitness said, from Suresh Singh’s house militants started firing at the troops, which by then laid a cordon around it. A police officer said militants after critically injuring Suresh’s tenant Madhu Sharma, held his wife, children, mother, brother and sister as hostages, adding that Madhu Sharma later succumbed to her injuries. They resorted to indiscriminate fire from their automatic weapons and hurled grenades on the troopers, he said. A vehicle of a television news channel too was hit by a grenade. 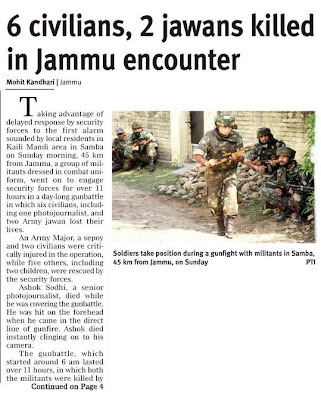 However, after rescuing the hostages, the Army used heavy mortar killing the two militants. The security forces launched a “mopping-up operation” searching the area, he added. According to the Army, Pakistan’s ISI has moved over 400 militants in different launching pads on other side of the IB. “It is quite possible that some of them might have sneaked during their intrusion bid in Bainglad area on Thursday night and carried out the attack this morning,” he added. It may also be mentioned here that the Tiger Division during the intervening night of May 9 and 10 had seized a huge quantity of arms and ammunition including 10 kg of RDX in Sujani forests of Samba district. Eight army jawans were today killed when an Army vehicle fell into the Chenab in Doda district of Jammu and Kashmir. A vehicle of the 8 Rashtriya Rifles was on its way to Doda town when it skidded off the road and rolled into the river at Ghat area in the afternoon, officials said. Three jawans died on the spot and two were injured critically and later died in the hospital. Three others drowned in the river and their bodies were yet to traced, they told PTI. This is third consecutive incident in which vehicles have skidded on the roads in Doda-Kishtwar in the past four days killing 48 persons and injuring 27. Thirty-six persons died and five were critically wounded when a bus fell into the Chenab in Kishtwar district on May 8. Four people were killed and 20 others injured when a matador fell into deep gorge in Bharat area of Doda district on May 10. The CBI has questioned UPSC Chairman Subir Datta as part of its probe into the alleged irregularities in the Rs 1,150-crore Barak missile deal with Israel. While the CBI was officially tight-lipped about the questioning, sources in the agency said Datta, who was a former defence secretary, was questioned to ascertain "certain facts" before the CBI quizzed George Fernandes who was the defence minister when the deal was signed in October 2000. 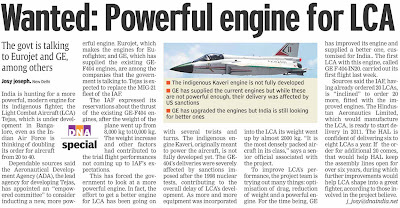 They said Datta was asked by the CBI about the note that was put before the Cabinet Committee on Security by Fernandes about the need for the procurement of Barak missiles from Israel in which opposition by a section of scientists was not mentioned. 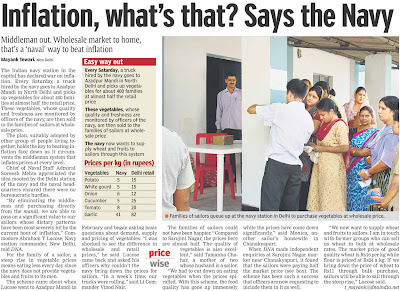 Datta, a 1967 batch IAS officer of the West Bengal cadre, who joined the Union Public Service Commission in July 2003, had also been examined by the CBI in the coffin scam earlier. 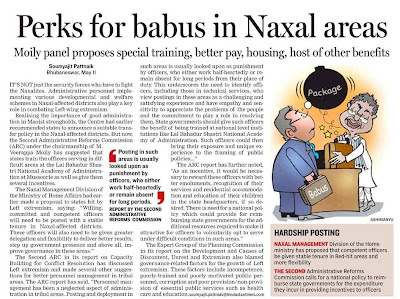 Stung by the growing number of Naxal-related incidents in the country, the government may soon give its nod for the formation of a Special Action Force (SAF) under the control of the CRPF to combat the Left-wing extremists. The proposal is awaiting "final" nod from the union home ministry, official sources said here. As per the proposal, the new force would comprise 10 battalions (10,000 personnel) and would be set up on the pattern of Greyhounds of the Andhra Pradesh police and would be under the command and control of the CRPF, the world's largest paramilitary force. While terming Left-wing extremism as a “virus” and the single biggest threat to internal security, Prime Minister Manmohan Singh, during his address to state chief ministers, had asked all states to set up specialised units to counter naxal activities in the country on the pattern of the Greyhounds. This force was set up by the Andhra Pradesh police in 1989 to counter the Naxals. The police force comprised best of the officers who had specialised in commando and jungle warfare. In its proposal, the CRPF has submitted that 10 fresh battalions should be sanctioned and in the meantime, it would deploy an equal number of personnel to begin operations from the day it was sanctioned. The proposed 10,000- odd men strong SAF would focus on “effectiveness and operational success”, they said. THE Indo-Pakistan border has been quiet ever since Pakistan unilaterally declared ceasefire on November 26, 2003. But the silence was shattered on Thursday night in the Samba sector of Jammu and Kashmir when about 15 infiltrators tried to sneak into the Indian territory while the Pakistan Rangers provided them with fire cover. More than 1,000 rounds were fired and nearly a dozen hand grenades lobbed. 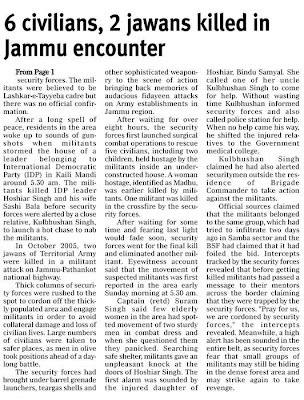 The Indian BSF retaliated. This was the fiercest encounter reported during the last five years. The infiltration was unsuccessful. What matters is that the intruders came from Pakistan, crossed the international border, reached up to the border fence erected within the Indian territory and tried to destroy it by lobbing hand grenades. Rangers provided them fire cover. When the firing was returned, they escaped into Pakistan. That is a clear proof of culpability and a grave provocation. It is necessary to eliminate the possibility of making similar attempts along the border elsewhere during the days to come. The timing of the incident is intriguing. A new democratic dispensation has taken over in Pakistan which has talked rather openly about mending fences with India. Even international pressure is there to make Pakistan shun terrorism. Not only that, Foreign Minister Pranab Mukherjee is scheduled to visit Pakistan later this month. The Pakistani officials who blessed the misadventure were surely not keeping the best interests of their country in mind. What must be realised is that such skirmishes can spin out of control. The trust built assiduously over this long period has been shattered. You cannot talk of confidence-building measures and peace initiative on the one hand and try to push in infiltrators on the other. One just hopes that the Commandant-level flag meeting likely to be held in the near future between the two countries will help ease the tension that has been built up by this foolhardy action. Wiser counsel should prevail and there should be no repeat of the intrusion. Nearly seven months after I had taken over as Army Chief, Director-General, Military Operations, informed me that although there was no official information, 58 Engineer Regiment supporting the Defence Research and Development Organisation (DRDO) at Pokharan had intensified its activities. Both of us understood its significance. Earlier, 8 Engineer Regiment had maintained two deep shafts in the area dug in 1981-82, added some more, and had gone through similar activities in 1995. Besides, the newly installed NDA regime had already declared that it favoured India becoming a nuclear power state. So, when a call came asking me to meet Prime Minister Vajpayee at his residence — 5 Safdarjang Road — on a holiday morning without indicating any agenda (similar calls had gone to the other two Service Chiefs), I had some idea of the discussion that was likely to take place. A few days later, India conducted Operation Shakti and became a nuclear weapon state! It is very unlikely that any political leader or nuclear scientist will remember the Corps of Engineers on the 10th anniversary of Operation Shakti. I must, however, do my duty to acknowledge and compliment the Corps, particularly its six regiments — 62, 113, 107, 267, 8 and 58 Engineer Regiments — which were deployed at Pokharan from 1973 onward till the success of the mission in May 1998. Post-nuclear tests reaction in military circles was of “great satisfaction”. Ever since 1979 when the Joint Intelligence Committee had informed the Chiefs about Pakistan’s efforts to go nuclear (China had conducted a nuclear weapons test in 1964), they had recommended “nuclear deterrence” as the best security option. It was better late than never! But the international reaction led by the United States was immediate and severe. President Clinton imposed economic, military and technological sanctions and went out of his way to make China an ally against India’s nuclear weapons requirement and aspirations. The Indo-US cooperation slate was wiped clean. After the US many other countries also imposed similar sanctions. A decade later all that is history. 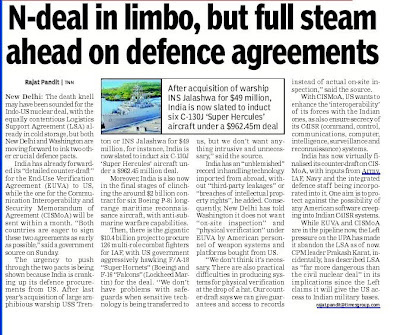 India and the US are not open-ended “natural allies” but Washington is prepared to sign the nuclear deal with New Delhi that would enhance India’s nuclear energy, technological and strategic capabilities. Unfortunately, many of our political leaders have not learnt the basic lesson from this episode, i.e. national interest and security are the ultimate goal of any government. This must be pursued relentlessly without fear or favour. Let us now turn to some other nuclear security-related issues. 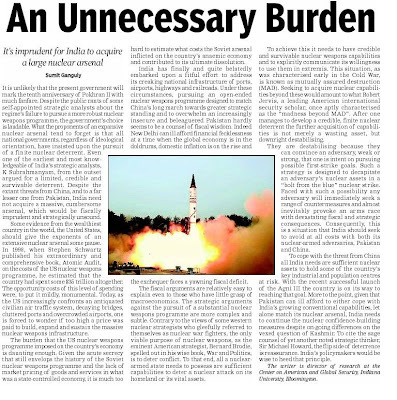 India prepared its draft nuclear doctrine -- an extremely fine job -- in 2001. But the Cabinet Committee on Security (CCS) did not give it the official clearance for two years. We did not know whether it was an official policy or just a draft. Mr Jaswant Singh kept it ambiguous but used its contents depending upon the occasion. As a result, there was no clarity on its operational mechanism. Operationalisation of the nuclear doctrine was reviewed officially in January 2003. The Press release on the subject had eight one-line statements restating important contents of the doctrine. It also made public the formation of the National Command Authority, the Political and the Executive Councils. According to the Press release, the CCS reviewed the existing command and control structures, state of readiness, targeting the strategy for retaliation and operating procedures for various stages of alert and launch. The CCS approved the appointment of C-in-C, Strategic Force Command, and the arrangements for an alternate chain of command. Technical claims of Pokharan-2 have been challenged by many scientists. One is not worried about the challenges made in the Western media. But many of our own scientists have created doubts in the mind of the public and, more importantly, of the end users — the armed forces. This doubt is compounded by the fact that our DRDO scientists are known for tall claims and over-optimistic public statements. Our long-term policy on fissile weapons and thermo-nuclear weapons is not yet clear. What progress has been made in this regard? Do we have adequate material for warheads to be made in future? How long are we going to take to develop the triad i.e. land, air and naval-based launch systems? The time taken to develop the Agni missile system shows that the current progress is far too slow. 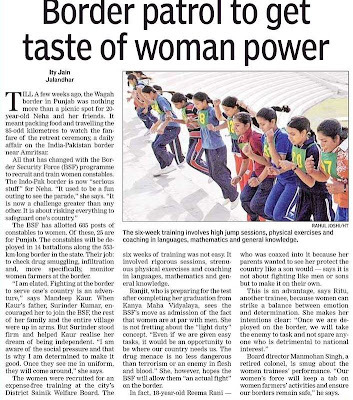 Why is the government unable to push this programme? Is it a political or technological problem? The nuclear doctrine calls for full integration of the doctrines concerning the armed forces, foreign policy, atomic energy, the DRDO and several other elements. How far have we been able to achieve this? Do our political leaders have the idea and the will to employ nuclear weapons in times of crisis? The lack of consensus on serious strategic issues like the Indo-US nuclear deal or our policy towards China does not inspire confidence. We now have the Strategic Forces Command, an inter-Services entity for strategic command and control. Have the Services developed a joint operational doctrine on the employment of nuclear weapons? Have we been able to interface the nuclear capability with conventional capability and plans in military strategy and force structuring? Nuclear doctrine calls for multiple agencies involved with storage, movements and assembly of devices. Has the Strategic Forces Command been able to interlock with the other agencies involved in this effort? Will these agencies be able to achieve these tasks in different contingencies in the “shortest possible timeframe”? Then there is also the psychological aspect of the deterrence. We should remember that if our leaders indulge in nuclear rhetoric about our nuclear arsenal/deterrence, it is considered irresponsible by the international community. But if we keep the capability highly secret, nuclear deterrence does not become credible. Our people must follow a clearly laid down public policy. There is no doubt that Pokharan-2 created some political, economic and technological difficulties for India initially. But before long, political and strategic advantages began to accrue. Besides enhanced security, we also achieved enhanced status in the international community. However, there is also a feeling among many strategists that the gains that we made soon after Pokharan-2 have been frittered away because we have succumbed to international pressure and due to lack of political consensus within the country. We have not pursued a clearly laid down nuclear deterrent policy with adequate determination. This must be done in the interest of national security, political differences notwithstanding.